The "LIVE" KAABOO mural by @kreashun is now complete and released to the public! “Converge” is the newest KREASHUN canvas piece by @jfeatherdesigns & @montymontgomery created “LIVE” at KAABOO Music and Art festival in Del Mar, California September 15-18, 2016. It was an amazing four days of creating while being surrounded by so many talented Artists and Friends! 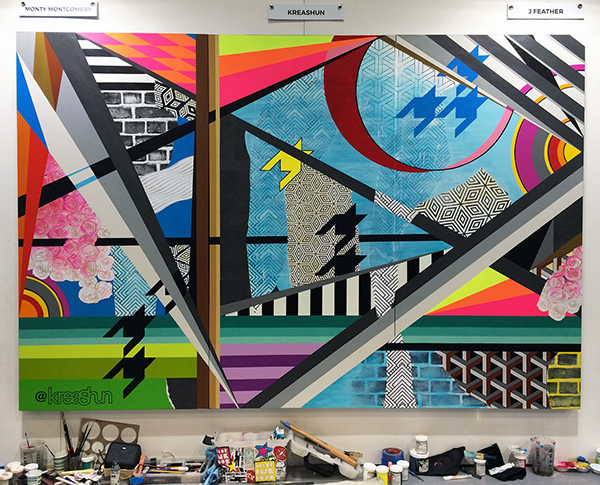 The piece came to life on three 3′ x 6′ x 2.5″ which can be shown as one or seperated into three individual works. “Converge” is now varnished and released to the public for purchase.